If you're hittingg hard faults with your ARM Cortex-M0+, it could be a problem with unaligned flash blocks. Eliminate your variables and narrow your scope when debugging. 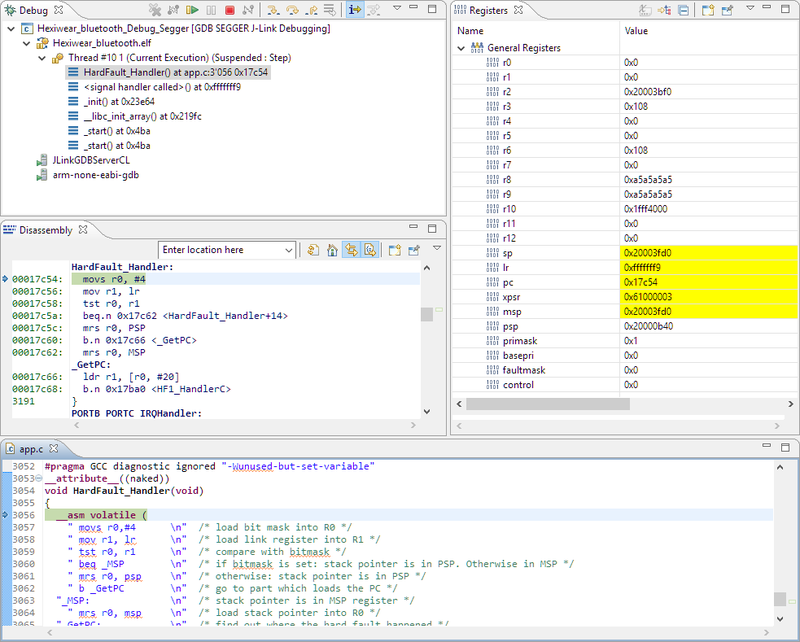 For background, I’m porting a project (NXP Kinetis KW40Z160) to Eclipse and the GNU tool chain for ARM. The application seems to run fine after downloading it with the debugger, but it crashes with a hard fault if either I do a ‘restart’ with the debugger or if I do reset the microcontroller with a SYSRESETREQ (see How to Reset an ARM Cortex-M with Software). Interestingly, that same code with the same registers/stack/etc. works fine the first time, but it breaks down later, after the application is running. 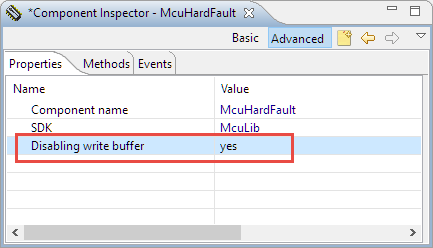 Checking the output of the hard fault handler? It didn't show anything usable. Stack pointer not aligned? No, that’s fine, and it works with the same values the first time. ARM/Thumb mode? Nope, all in Thumb mode. Stack readable/writable? Yes, and no special protection or other kinds of things were used. Interrupt priorities? Nope, it happens with interrupts disabled. Is it a problem with the debugger? 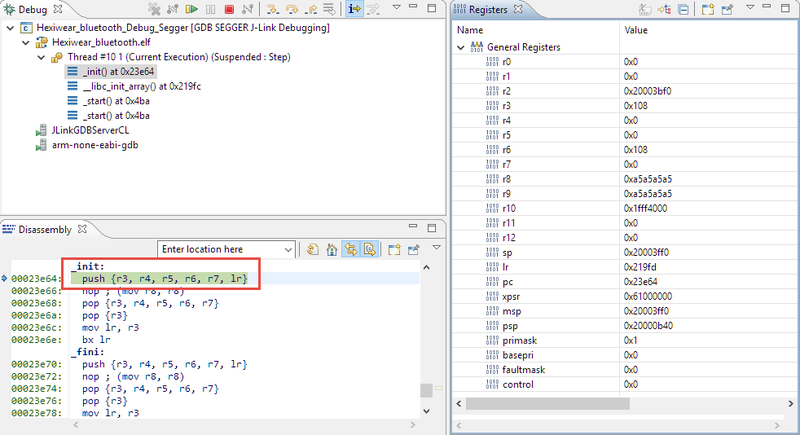 Nope, tried both Segger and P&E, same for both, and it happens with and without a debugger attached or used. Well, that’s the point where I ran out of ideas. What remains is the desperate attempt to ask colleagues, which returned a similar list of points as above. So no progress. I still had no clue. What I ended up trying was to do a ‘binary’ search: disabling portions of the application to find out if there is something causing the problem. Yes, it's time-consuming, but that was my only option. So I turned on/off parts of the application to find out what part of the application was causing the problem. At first, erasing it seemed to work fine, but then the microcontroller would crash after a restart. Dealing with hard faults on ARM is not easy. This particular one was caused by erasing a flash memory block that was not aligned. It seems to me that somehow the internals of the processor got screwed up when that happened. The challenge was that it then crashed in a way not very closely related to the cause of the problem. These kinds of problems are not easy to find and solve. What usually works best, and what worked in this case, is trying to reduce the problem: Have a ‘working’ code and have a ‘failing’ version. Try to eliminate all variables (board, debugger, power supply, host machine) and then reduce the problem to narrow it down as much as possible. In any case, I hope this post can help others. And yes, some luck helps accelerate that process.